› Author Affiliations Funding This research is supported by a grant (No. R01HS022670) from the Agency for Healthcare Research and Quality (AHRQ). The content is the sole responsibility of the authors and does not necessarily represent the official views of AHRQ. Objective Over the last decade, electronic health records (EHRs) have shaped clinical practice. 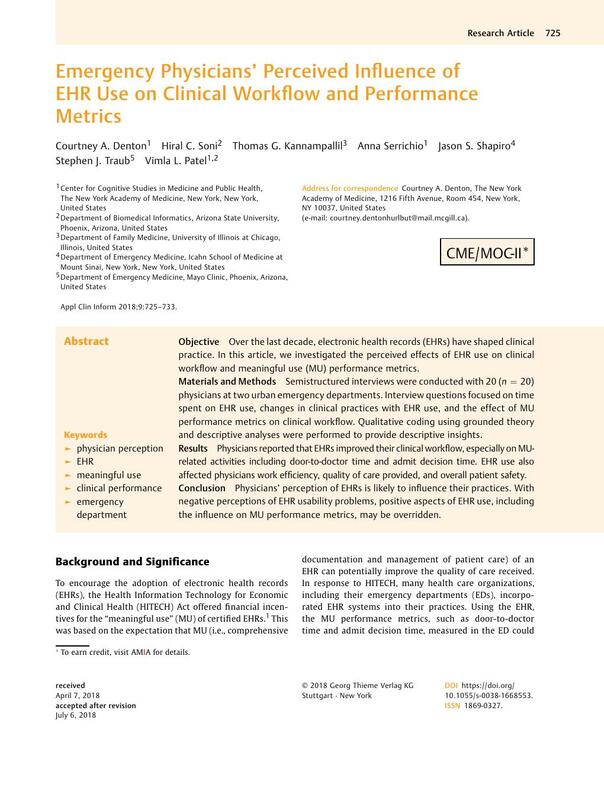 In this article, we investigated the perceived effects of EHR use on clinical workflow and meaningful use (MU) performance metrics. Materials and Methods Semistructured interviews were conducted with 20 (n = 20) physicians at two urban emergency departments. Interview questions focused on time spent on EHR use, changes in clinical practices with EHR use, and the effect of MU performance metrics on clinical workflow. Qualitative coding using grounded theory and descriptive analyses were performed to provide descriptive insights. Results Physicians reported that EHRs improved their clinical workflow, especially on MU-related activities including door-to-doctor time and admit decision time. EHR use also affected physicians work efficiency, quality of care provided, and overall patient safety. Conclusion Physicians' perception of EHRs is likely to influence their practices. With negative perceptions of EHR usability problems, positive aspects of EHR use, including the influence on MU performance metrics, may be overridden. The institutional review board of the hospitals (Icahn School of Medicine at Mount Sinai, Mayo Clinic) and that of The New York Academy of Medicine approved this study. Written consents were obtained from all participants.